CIHR’s research areas take several different forms. The large projects, listed below, result in research workshops that lead to books and other published material. Information about these research areas can be found below. 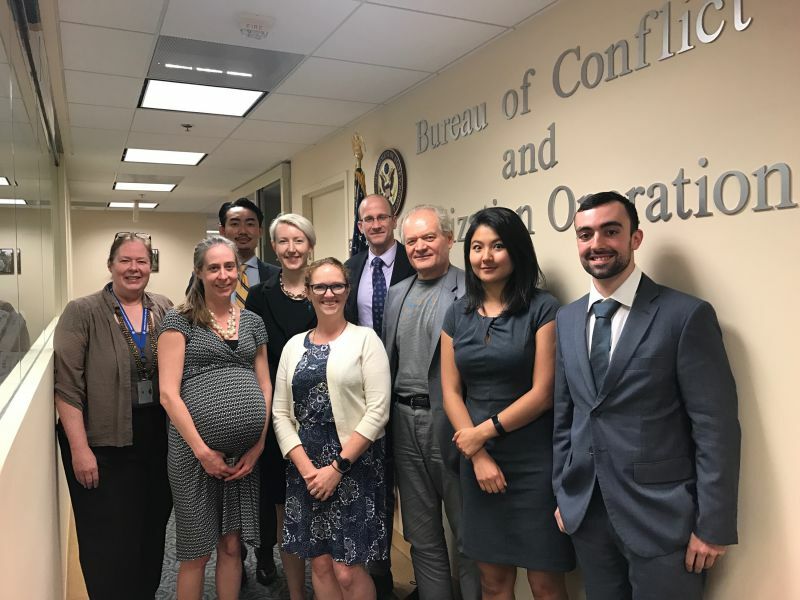 T his research, conducted under the auspices of the Center for International Human Rights as part of the Diplomacy Lab project of the United States Department of State, examines three case studies of local peace initiatives in conflict and post-conflict environments. The case studies—Liberia, Nicaragua, and Somalia—offer insights into different variables at the local level that influence national-level peace. The research found that the common factor that invites local peacebuilding initiatives is an absence of coherent or effective national leadership. In such cases, as demonstrated in all three case studies, a non-traditional actor steps in to fill the leadership vacuum in local communities. Each case study in this research varies along the following factors: the type of non-traditional actor; the process by which this actor assumed the local leadership position; and the reach of the peacebuilding initiatives. This study can contribute to the reevaluation of the concept of peace. Peacebuilding efforts at the local level introduce narratives and nuances that are often overlooked when looking exclusively at national and international peacebuilding. Moving beyond defining peace through merely the absence of conflict, the local helps reconceptualize peace, bringing into the picture everyday life. The development of the ROL in post-conflict countries constitutes one of the main challenges to UN field operations. The idea is to critically examine key aspects of the ROL issue and explore the building blocks of what constitutes a sustainable Rule of Law component in UN Peace Operations, as well as analyze and assess the key challenges that such an endeavor will have to address. The first workshop in this research project is expected in Spring 2016. Please continue to check back for more information. The CIHR, in collaboration with the Center for Security Studies (KEMEA) of the Hellenic Ministry of Citizen Protection, organized a second research workshop with the purpose of critically examining key political, economic and security developments influenced by migratory flows. The workshop built on the work of an earlier workshop that we held on this topic (December 2011) in which participants were asked to address the following issue areas: the causes of migratory flows; the international and regional legal frameworks for managing migration and for strengthening border security ; the challenges of devising migratory policies that are consistent with international rules and standards; and the challenges confronting effective cross-border cooperation in dealing with the impact of migratory flows. The second workshop focused on the following: (1) a critical assessment of the European Internal Security Strategy’s prospects, taking into consideration the lessons learned from the deployment of Rapid Border Intervention Teams and FRONTEX: (2) How can we collect better data and knowledge on migrant populations, more specifically, on location, profile and potential vulnerabilities? How can better data help us address such vulnerabilities? (3) How can we develop better coordination, both intra-state as well as inter-state, among the different agencies dealing with migration issues? and (4) what are some of the key challenges in managing migration in times of economic and social crisis? 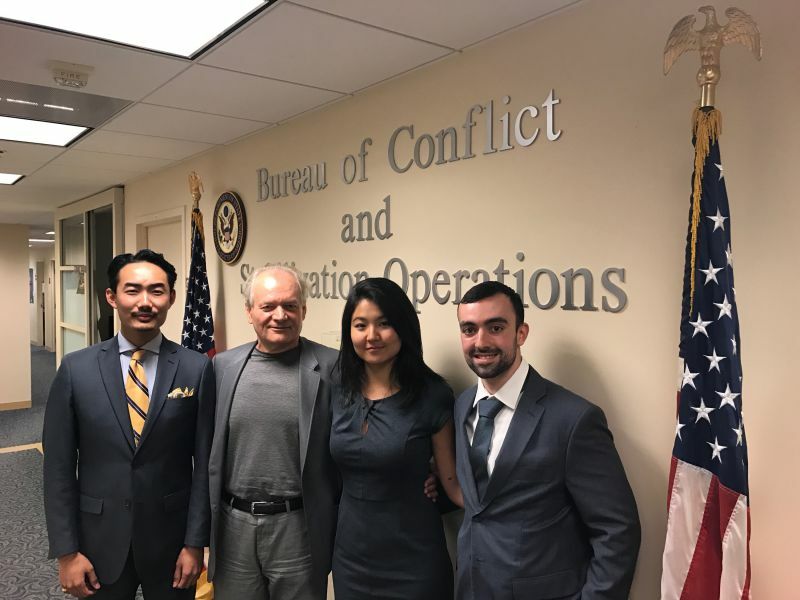 CIHR and the Institute for Criminal Justice Ethics, John Jay College of Criminal Justice, organized a workshop to discuss the implications over the last past 25 years on private military and security companies and how they have increased their share of the defense budget. These contractors provide basic logistics, feed and supply enlisted men and women, develop and direct sophisticated weapons systems, administer detention facilities and conduct interrogations, and provide personal security for the staff of intergovernmental as well as non-governmental organizations. If the privatization of security functions is here to stay (and this clearly seems to be the case), then the key tasks at hand are: (1) to understand the origins, causes and multiple manifestations of such outsourcing; and (2) to devise an effective regulatory framework that would be consistent with the exigencies of democratic control and would adhere to fundamental human rights and humanitarian law rules and standards. CIHR and the Institute for Criminal Justice Ethics, John Jay College of Criminal Justice, are organizing a workshop to discuss the ethical dimensions of humanitarian intervention and of its latest variation, the responsibility to protect (R2P). For that purpose the workshop will cover the following three topics: (1) Humanitarian Intervention (HI) and Responsibility to Protect (R2P), (2) The Interplay between the Global and the Local in Intervention/ Protection, and (3) Accountability for Intervention/Protection-Related Activities Original contributions will be published in Criminal Justice Ethics (CJE). CJE is a semi-annual journal designed to focus greater attention on ethical issues in criminal justice (broadly defined) by philosophers, criminal justice professionals, lawyers and judges, and the general public. The Journal is published by Routledge. 1) Humanitarian Intervention (HI) and Responsibility to Protect (R2P). Since much of the discussion is now focusing on the responsibility to protect (R2P) doctrine, it is important to address the nature and extent of the change from the 1990s in which the focus was on humanitarian intervention. What has been maintained and what has been lost in the transition from HI to R2P? What is the ethical legitimacy of the proposed threshold and prudential criteria for action? What are the ethical implications of the expanded notion of security characteristic of R2P? How has the “war on terror” discourse affected the framing of humanitarian initiatives and the shift in emphasis from intervention to protection? 2) The Interplay between the Global and the Local in Intervention/ Protection. Many analyses have portrayed interventionary/protective initiatives as the result of a decision to act as opposed to a decision to abstain from involvement in a particular crisis. Such an interpretation is premised on the notion that crises are primarily local; yet, others would argue that there is a dynamic interplay between global and local processes and that the global is shaping local dynamics in a way that exacerbates intra-societal tensions, thus leading to the call for intervention/protection. What have the post-cold war humanitarian crises taught us about the interplay between global and local processes? Since intergovernmental organizations often make decisions with ethical implications, what set of values should guide international action in these situations? The use of force for human protection purposes is always seen as an option of last resort. However, recent crises have brought it to the forefront and, on several occasions the use of force has even been proposed by human rights and/or humanitarian advocates. Yet, there has been less discussion on the ethical responsibilities of interveners/protectors and on mechanisms, both ex ante and ex post to ensure accountable conduct. Who are the relevant stakeholders in these situations? How can the interveners/protectors be held accountable and to whom? What are their ethical obligations during the conflict, as well as during the post-conflict phase? What are the moral responsibilities of human rights and humanitarian NGOs who call for the use of force in particular situations? United Nations Security Council Resolution (UNSCR) 1820 first linked sexual violence in conflict to international peace and security in 2008 though the connection of women to peace and security first appeared on the agenda in UNSCR 1325 in 2000. CIHR’s research study on sexual violence in conflict situations seeks to examine the challenges with implementing UNSCR 1820, both by the UNSC and by the NGO community. The following report has been prepared in order to address the role of the United Nations Security Council (UNSC) in implementing United Nations Security Council Resolution (UNSCR) 1820 of 19 June 2008 on Sexual Violence in Conflict (SVC). UNSCR 1820 has emphasized the link between sexual violence in conflict and the maintenance of international peace and security — primary objective of the UNSC. Although the linking of women to the international peace and security agenda first appeared in UNSCR 1325 of 31 October 2000, UNSCR 1820 goes further. It is the first UNSCR to recognize sexual violence in conflict as a self-standing international security issue; moreover, it constitutes an attempt to take implementation seriously since it “requests the Secretary-General to submit a report to the Council by 30 June 2009 on the implementation of this resolution in the context of situations which are on the agenda of the Council” (UNSCR 1820 (2008): Operative paragraph 15). The second study focuses on plausible collective strategies for the more effective implementation of United Nations Security Council Resolution (UNSCR) 1820, and of related resolutions dealing with sexual violence in conflict and post-conflict settings. It is based on the deliberations of a strategy session that took place during the week of September 21-25 2009 among members of the Women Peace Builders’ Community of Practice, as well as other NGOs and stakeholders under the auspices of the International Women’s Tribune Center. CIHRs will explore key challenges confronting law enforcement in dealing with transnational threats, in particular terrorism and transnational organized crime (TOC) thanks to a significant grant recently awarded by the Stavros Niarchos Foundation. The program will involve law enforcement officers from Greece, Turkey and other Balkan countries, as well as academics and representatives of intergovernmental and non-governmental organizations. Through this grant, John Jay College of Criminal Justice will examine key challenges confronting the law enforcement community in dealing with three key transnational threats: terrorism; drug-trafficking; and human trafficking/ migrant smuggling. The grant will fund a series of workshops that will not only provide insights into these ongoing challenges but also contribute to the strengthening of regional security networks capable of dealing with problems posed by terrorism and transnational organized crime. The Center for International Human Rights, as part of its “Policing Across Borders: the Role of Law Enforcement in Global Governance” Project, has organized four international workshops involving law enforcement officers from Greece, Albania, Bosnia-Herzegovina, Bulgaria, Romania, and Turkey, as well as academics and representatives of intergovernmental and non-governmental organizations. The Project is funded by a generous grant by the Stavros Niarchos Foundation. The first two workshops will examine existing legislative and institutional initiatives in these issue areas, assess their strengths and weaknesses and explore the prospects for more effective regional collaboration. The third workshop will build on the findings of the two workshops and examine the ways in which recent initiatives focusing on policy advocacy, revision of legislation, capacity building and the development of operational networks for action at the national and regional levels can strengthen the overall contribution of law enforcement to governance. The findings of these workshops will result in a scholarly publication and in the preparation of a manual on best practices to ensure effective transnational police cooperation and strengthen regional police networks. Law enforcement from Greece, Turkey and other Balkan countries, as well as academics and representatives of both intergovernmental and non-governmental organizations will participate in these workshops. These workshops will be organized by the Center for International Human Rights and held at John Jay College in cooperation with the Center for Security Studies (KE.ME.A.) at the Greek Ministry of Public Order. Professor George Andreopoulos, Director of the Center for International Human Rights at John Jay College of Criminal Justice, will direct this project. Building on the momentum generated by these workshops, the grant will also support development of a masters level scholarship program for Greek law enforcement officers, to be selected by the Center for Security Studies (KE.ME.A.) at the Greek Ministry of Public Order. The Stavros Niarchos Foundation (www.SNFoundation.org), an international philanthropic organization, supports charitable activities in four primary areas: arts and culture, education, health and medicine, and social welfare. The Foundation, governed by its Board of Directors, makes grants to not-for-profit organizations throughout the world. In addition, the Foundation maintains a major commitment to supporting programs in Greece through the guidance of a locally based advisory committee. The CIHR sponsored a workshop of human rights experts on the newly created United Nations Human Rights Council (UNHRC). The workshop took place at John Jay College on June 12, 2006 and addressed issues relating to the potential, as well as to the opportunities and the challenges facing this new institution. The workshop was organized under the direction of Professors George Andreopoulos of John Jay College, Zehra Arat of SUNY Purchase, and Julie Mertus of American University. The participants drafted a statement which was sent to the UNHCR, which was holding its first meeting in Geneva. In addition, the statement was distributed among UN agencies and professional associations.